I have this weekend off from hosting our usual Sunday family supper. I’ll certainly miss seeing everyone gathered together but will take advantage of the break. Of course, hubby and I still have to eat, so I’m preparing today’s meals as I type. The menu will include “Clean-Out-the-Pantry-&-Fridge” soup, garden veggie salad and fresh bread. I started this process by tossing together some bread dough in the mixer. I have an easy basic recipe that I add random ingredients to. My basic recipe is 1c. warm water, 2 tsp yeast, 2TB sugar, honey or maple syrup, 2TB of Coconut Oil, Butter or Olive Oil, 1 tsp of salt … I let that sit for a bit and then add flour. At least 1c. of organic white, then 1/2c at a time of whole wheat, spelt, buckwheat, quinoa or other nutritious flours, while the miixer is kneading, until a soft ball of dough is formed. I move the ball of dough to a greased bowl and let it rest and rise in a warm location. My next step is pulling all the vegetables out of my fridge crisper drawers, then I go through the cool storage pantry and look for any vegetables that might start to spoil. 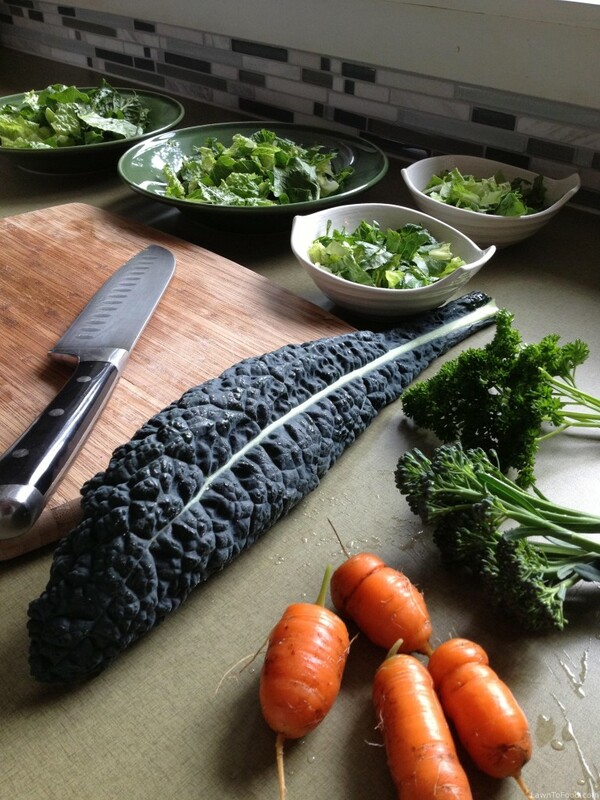 With a mountain of vegetables on my counter I start to create my soup and salads for the day. I use up the lettuce, washing and bagging any leftovers. Purple cabbage shreds add a bright color to the salads, green onion tops work there too. The tough white parts of the green onion head to a roasting pan, that I have set nearby. Yesterday, I found some carrots left in the garden while turning in compost, they are next on my chopping block. Some grated carrot into the salads and chunks head to the roast pan. A small spike of broccoli that survived the winter in our garden will be eaten raw on top of the salads and so will some finely chopped kale and parsley. As you can see, I’m making 2 larger salads for our lunch and 2 smaller ones for dinner. In the pantry, I found some butternut squash, onions that were getting soft and cloves of garlic that were starting to sprout. I peeled and prepared those before they got dropped in the roasting pan, along with some tough outer celery stalks. I tossed all of the pan vegetables with a drizzle of olive oil and sprinkled with salt and pepper. I will roast these vegetables for about 40 mins at 350F. The bread is ready for forming into buns or loaves now. After I form the dough, I let it rest for about 15-30 minutes in its new shape. As soon as the vegetables are roasted off, the bread goes into the pre-heated oven for baking. It’ll take 15-35 minutes to completely bake the bread, depending on which shape I have created. During this time, I’ll transfer the vegetables to a soup pot and add stock. I have vegetable stock that I canned last summer, or you can use a store bought carton. Bring the soup pot up to a simmer and once everything is soft, I puree the soup with an immersion blender. That’s about it. As the bread is finishing baking, I’ll clean out the fridge crisper drawers, to get them ready for a week of fresh groceries … and those extra cloves of sprouting garlic … I intend to plant them in the garden along side my colorful cauliflower starts. 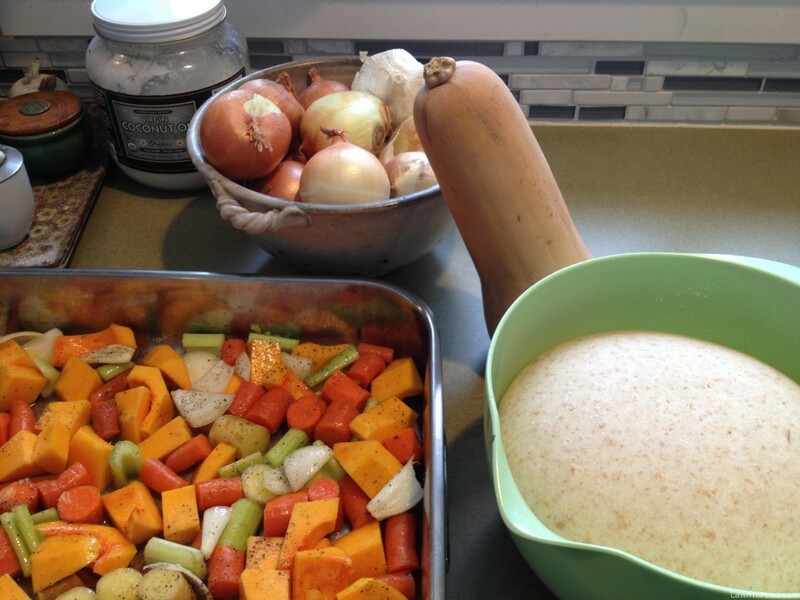 This entry was posted in Fresh Vegetable Ideas, Let's Eat, Reep the Harvest and tagged bread, clean the fridge, harvest, soup, vegetables by Lynda. Bookmark the permalink.